EHS junior Haley Burton (2) attempts a dig during the Lady Eagles victory over Belpre on Monday night in Tuppers Plains, Ohio. TUPPERS PLAINS, Ohio — Second verse same as the first. 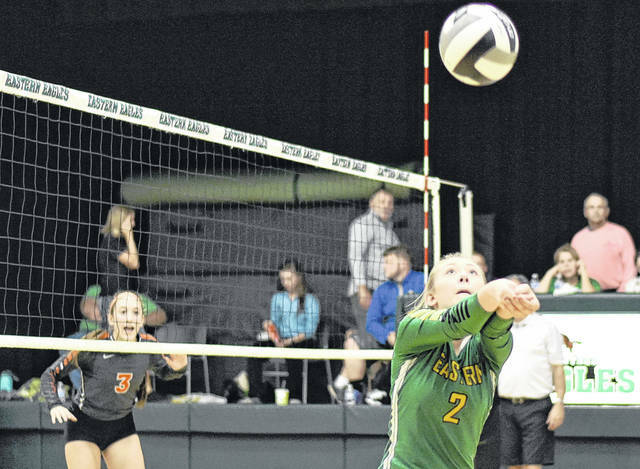 The Eastern volleyball team soared to a three games to none victory over Tri-Valley Conference Hocking Division foe Belpre — earning a season sweep of the visiting Lady Golden Eagles — on Monday night in Meigs County. 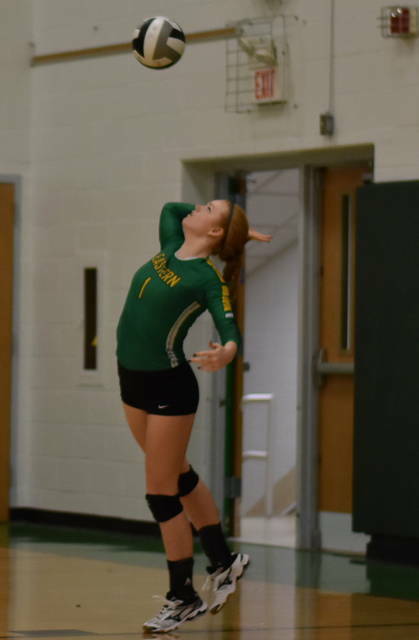 The opening set was tightly contested early, as the Lady Eagles (7-3, 6-2 TVC Hocking) took a 7-5 advantage, before manufacturing an 18-8 scoring run to close out a 25-8 victory. The second game was a see-saw exchange as Eastern soared to a 10-7 lead before Belpre rallied to knot the set at 11-all. before finally locking together at 11-all. From there, EHS never trailed again in the contest, as the utilized a 14-7 scoring run and rolled to a 25-18 win. Following a 4-all tie in the finale, Eastern never surrendered the lead again and rolled to a 25-17 win while earning a 3-0 match victory. The Lady Eagles service attack was led by Kelsey Casto with 13 points, while Alexus Metheney followed with 10. Kylie Green was next with six service points, while Haley Burton, Jenna Chadwell and Allison Barber each finished with four, respectively. Caterina Miecchi posted two points to round out the Eastern service attack. The Lady Golden Eagles service attack was led by Savannah Knotts with five points, as Hannah McDaniel was next with four. Alyssa Hutchinson and Dekotah Lemon followed with three service points apiece, respectively, while Sydney Spencer was next with two. Kaitlin Richards concluded the service attack for Belpre with one point. Following the match EHS first-year head coach Mykala Sheppard was pleased with her team’s performance particularly their ability to adapt. The triumph for Eastern clinched a season sweep of the Lady Golden Eagles, having earned a 3-1 match victory on Aug. 28 in Belpre. The Lady Eagles returned to action on Tuesday, as they travelled to face Tri Valley Conference Hocking Division foe Southern.